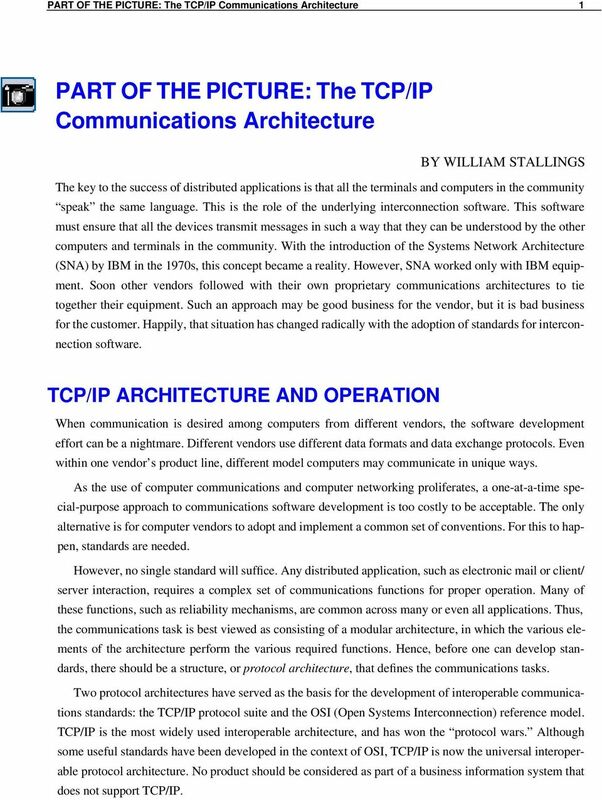 Download "PART OF THE PICTURE: The TCP/IP Communications Architecture"
1 PART OF THE PICTURE: The / Communications Architecture 1 PART OF THE PICTURE: The / Communications Architecture BY WILLIAM STALLINGS The key to the success of distributed applications is that all the terminals and computers in the community speak the same language. 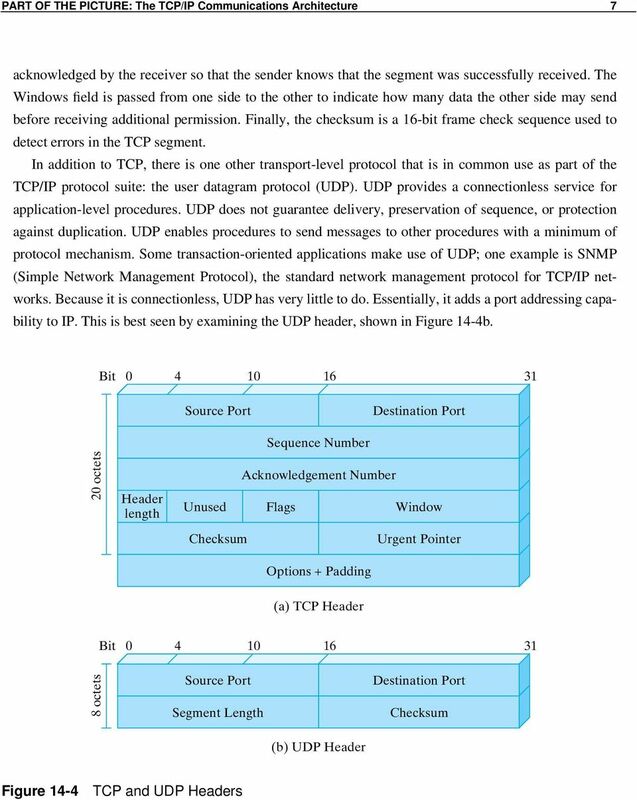 This is the role of the underlying interconnection software. This software must ensure that all the devices transmit messages in such a way that they can be understood by the other computers and terminals in the community. With the introduction of the Systems Network Architecture (SNA) by IBM in the 1970s, this concept became a reality. However, SNA worked only with IBM equipment. Soon other vendors followed with their own proprietary communications architectures to tie together their equipment. Such an approach may be good business for the vendor, but it is bad business for the customer. Happily, that situation has changed radically with the adoption of standards for interconnection software. / ARCHITECTURE AND OPERATION When communication is desired among computers from different vendors, the software development effort can be a nightmare. Different vendors use different data formats and data exchange protocols. Even within one vendor s product line, different model computers may communicate in unique ways. As the use of computer communications and computer networking proliferates, a one-at-a-time special-purpose approach to communications software development is too costly to be acceptable. The only alternative is for computer vendors to adopt and implement a common set of conventions. For this to happen, standards are needed. However, no single standard will suffice. Any distributed application, such as electronic mail or client/ server interaction, requires a complex set of communications functions for proper operation. Many of these functions, such as reliability mechanisms, are common across many or even all applications. 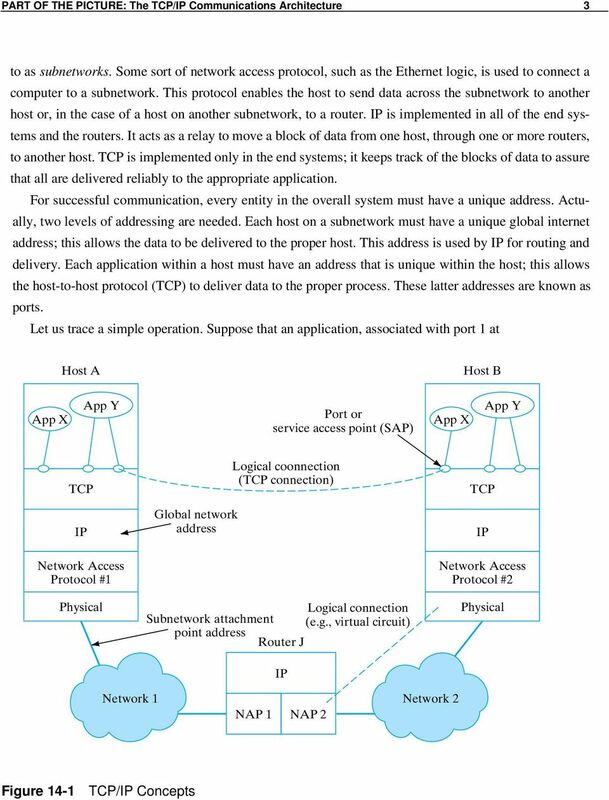 Thus, the communications task is best viewed as consisting of a modular architecture, in which the various elements of the architecture perform the various required functions. Hence, before one can develop standards, there should be a structure, or protocol architecture, that defines the communications tasks. Two protocol architectures have served as the basis for the development of interoperable communications standards: the / protocol suite and the OSI (Open Systems Interconnection) reference model. / is the most widely used interoperable architecture, and has won the protocol wars. Although some useful standards have been developed in the context of OSI, / is now the universal interoperable protocol architecture. No product should be considered as part of a business information system that does not support /. 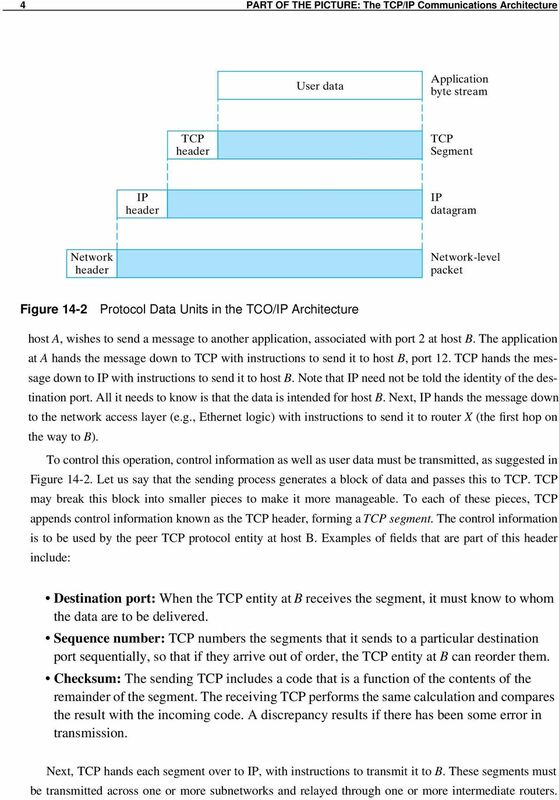 4 4 PART OF THE PICTURE: The / Communications Architecture User data Application byte stream header Segment header datagram Network header Network-level packet Figure 14-2 Protocol Data Units in the TCO/ Architecture host A, wishes to send a message to another application, associated with port 2 at host B. The application at A hands the message down to with instructions to send it to host B, port 12. hands the message down to with instructions to send it to host B. Note that need not be told the identity of the destination port. All it needs to know is that the data is intended for host B. 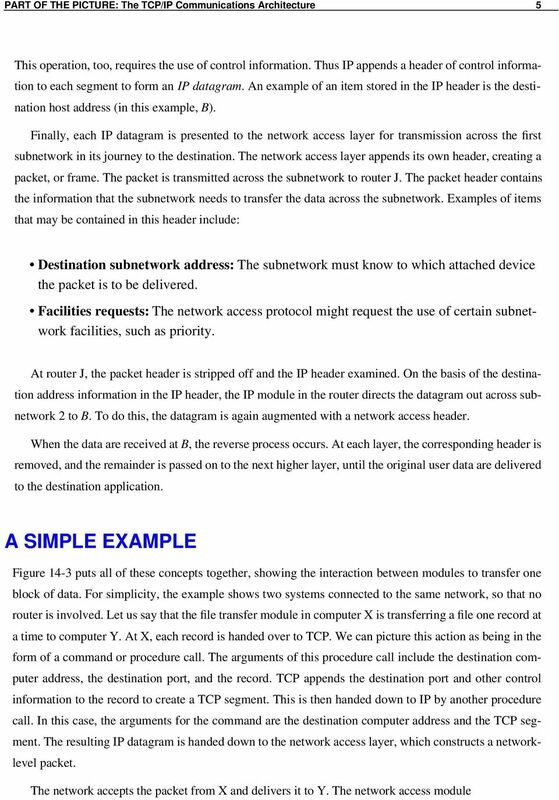 Next, hands the message down to the network access layer (e.g., Ethernet logic) with instructions to send it to router X (the first hop on the way to B). To control this operation, control information as well as user data must be transmitted, as suggested in Figure Let us say that the sending process generates a block of data and passes this to. may break this block into smaller pieces to make it more manageable. To each of these pieces, appends control information known as the header, forming a segment. The control information is to be used by the peer protocol entity at host B. Examples of fields that are part of this header include: Destination port: When the entity at B receives the segment, it must know to whom the data are to be delivered. Sequence number: numbers the segments that it sends to a particular destination port sequentially, so that if they arrive out of order, the entity at B can reorder them. Checksum: The sending includes a code that is a function of the contents of the remainder of the segment. The receiving performs the same calculation and compares the result with the incoming code. A discrepancy results if there has been some error in transmission. Next, hands each segment over to, with instructions to transmit it to B. 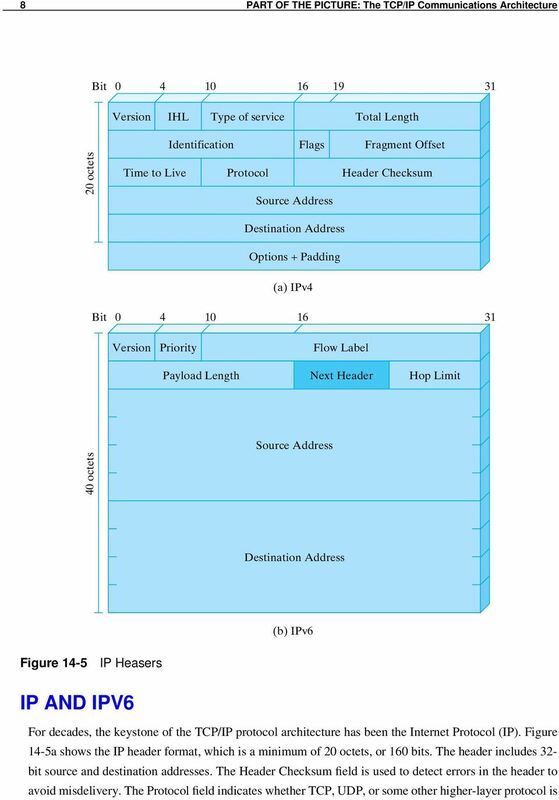 These segments must be transmitted across one or more subnetworks and relayed through one or more intermediate routers.